Initially, the idea was to develop an MP3 player and make it available to private enthusiasts. However, this soon resulted in applications for commercial and industrial applications, and Loetronic was founded. 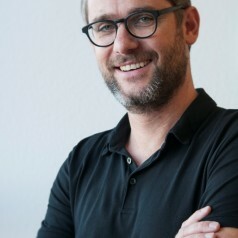 Soon the core competency was clear: the development, the production and the distribution of digital audio modules, mostly on MP3 and Flashcards basis for the integration into customer-specific electronics. Over the years, Loetronic's modules got installed wherever voice announcements or music content have to be played. The audio modules were constantly developed out. Initially, hard disks and CD-ROMS were focussed on as storage media, later these memory forms were replaced by flash memory, first CF, then SD card storage. Every now and then it was also demanded that the audio content could be played over LAN and WLAN interfaces in real-time (streaming). The external control possibilities were developed similarly. In the beginning control was limited to pushbuttons, but later RS232, RS485, LAN and WLAN interfaces were added, as well as the use of barcode and RFID readers, motion detectors and various customer-specific controls. In 2009, it was necessary to develop a new MP3 module and bring it to the market. It was to be very universal and powerful, as well as very modular and easy to adapt. Designed to be manufactured in higher volumes for many years, it should replace a number of similar, but very different MP3 modules. The ULTRA MP3 module was born (Figure 2)! 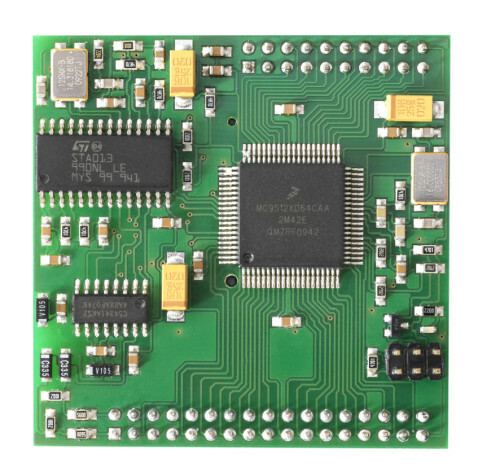 The ULTRA MP3 module is based on a 16-bit microcontroller from Freescale (NXP) and has an SD memory card slot. An MP3 decoder chip and a high-quality D/A converter complete the main components. The module itself measures 55 x 55 mm and is plugged onto the carrier board via two sockets. The module can be controlled via pushbutton inputs, various digital inputs, two serial interfaces (with baudrates up to 115200 bps and 921600 bps). Outputs for connection to a LC display, LEDs and relays are also available. The decoded audio information can be passed in analogue (stereo) or digital (I2S) fashion. 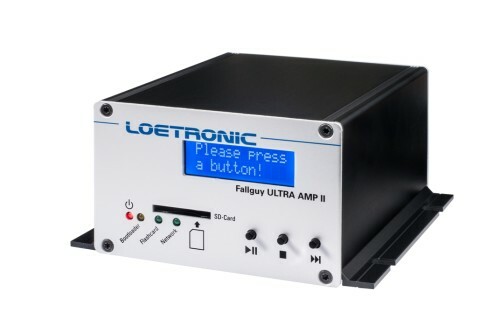 In addition to a standard firmware for the ULTRA MP3 module, Loetronic has also created a variety of customer-specific firmware versions that utilise the MP3 module in different ways. The installation of new firmware usually takes place via the SD card, but can also be done via the serial interfaces and especially by the customers themselves.